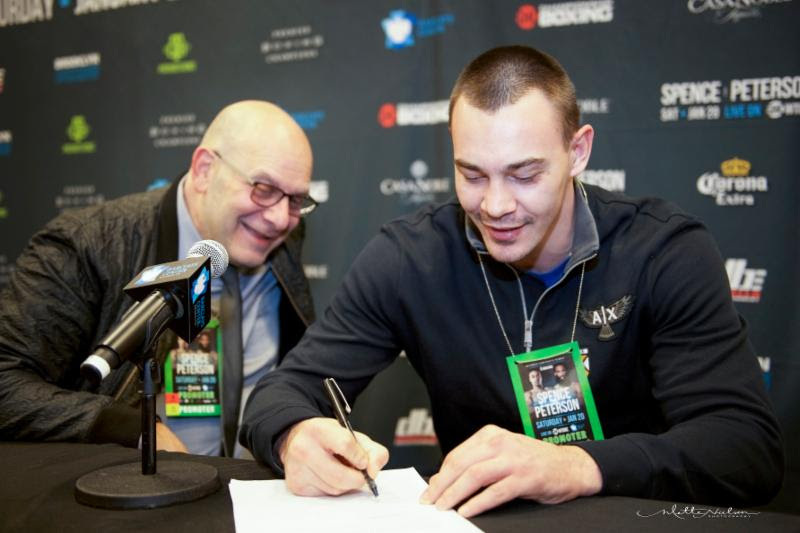 DIBELLA ENTERTAINMENT (DBE) has signed highly touted undefeated heavyweight prospect OLEKSANDR “Sasha” TESLENKO to an exclusive promotional contract. Teslenko will make his DBE debut on Broadway Boxing, next Wednesday, February 7, at B.B. King Blues Club & Grill in Times Square, New York City. Broadway Boxing is presented by Nissan of Queens, Azad Watches, OPTYX, and Christos Steak House. The powerful 25-year-old Teslenko, who stands 6’5″, sports a record of 11-0 with 9 KOs, and will face KEENAN HICKMAN (6-2-1, 2 KOs), of Baton Rouge, Louisiana, in an 8-round bout. Born in Chernivtsi, Ukraine, Teslenko took up boxing at age eight when his father brought him to a gym to learn how to defend himself. As an amateur, Teslenko became a three-time Ukrainian National champion while accumulating an impressive 224-23 record. During this time, Teslenko also earned a degree in Marketing from the University of Chernivtsi and served in the Ukrainian Army alongside DBE stablemate Ivan Golub. Teslenko took a bold step in search of success as a professional boxer, leaving his family behind, relocating to Canada with little contacts and settling in Toronto. Sharing a house with three other Ukrainians and sleeping on a mattress on the floor, Teslenko worked construction to earn extra money while taking classes to learn English. He made his pro debut in September 2015. Teslenko is coming off a second-round knockout of Nick Guivas on October 14, in Ontario, Canada. Earlier in 2017, Teslenko was victorious in two fights held in California with an eight-round decision against Bernardo Marquez on February 24, followed by a third-round knockout of Juan Goode on July 22. The February 7 installment of the acclaimed Broadway Boxing series is headlined by a crosstown clash of unbeaten welterweights NOEL MURPHY (12-0, 2 KOs), of Woodlawn, New York and Brooklyn’s MIKKEL LESPIERRE (18-0-1, 8 KOs).